Mr. Angel Gurría, Secretary-General of the OECD, is attending the COP21 taking place from 30 November to 11 December 2015 in Paris. He was at the opening of Paris 2015 - Leaders Day, alongside the heads of state and government. He also participated in several high-level events, and held bilateral meetings with numerous leaders attending the COP21. 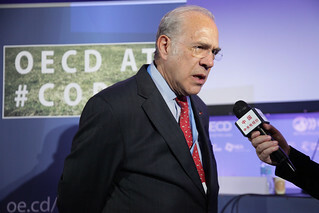 30 November 2015 - OECD Secretary-General Angel Gurría at COP21. Le Bourget, France.